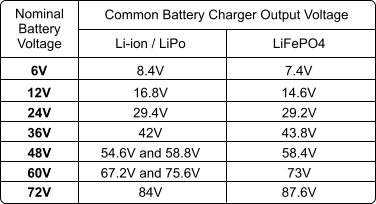 The battery chargers sold on this page are for LiFePO4, Li-ion, and LiPo batteries and battery packs. 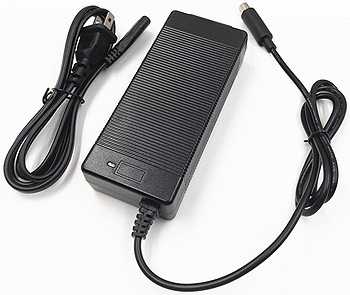 We can install any type of connector on any battery charger. If you need a different type of output plug installed on a battery charger sold below please contact us to special order it. *3P Plug has a 1/2" OD insert and 3PS Plug has a 3/8" OD insert. Battery charger for 12 Volt LiFePO4 batteries. Wall type charger. Multiple output plug connector options. Battery charger for 12 Volt LiFePO4 batteries. Floor type charger. Available with Coaxial plug, RCA plug, XLR plug, or House plug output connector. Battery charger for 12 Volt LiFePO4 batteries. 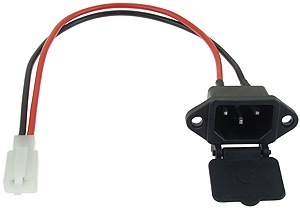 Available with Coaxial plug, RCA plug, XLR plug, House plug, or 3P plug output connector. Battery charger for 24 Volt LiFePO4 batteries. 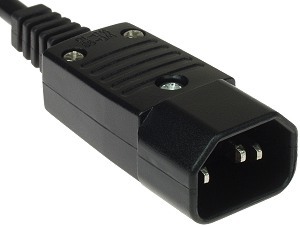 Available with RCA plug, XLR plug, or House plug output connector. Battery charger for 24 Volt LiFePO4 batteries. Available with Anderson PP45 and House plug output connectors. 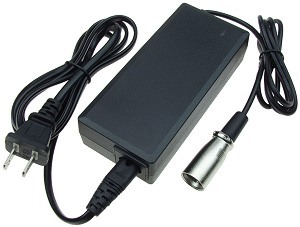 Battery charger for 24 Volt Li-ion (Lithium ion) and LiPo (Lithium Polymer) batteries. 100-240VAC input power. 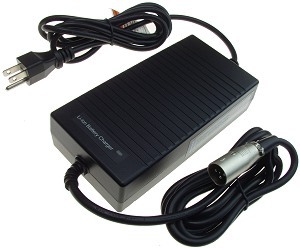 Available with RCA, XLR, or House plug output connector. 42 Volt 2 Amp battery charger for 36 Volt Li-ion (Lithium Ion) and LiPo (Lithium Polymer) batteries. Available with RCA, XLR, House, 3P, or 3PS plug output connector. 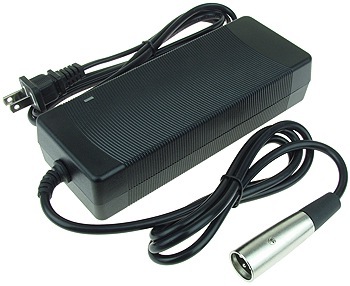 42 Volt 2 Amp battery charger for Bird, Lime, and Xiaomi Mijia (Mi) M365 electric scooters. Battery charger for 36 Volt Li-ion and LiPo batteries. 100-120VAC input power. 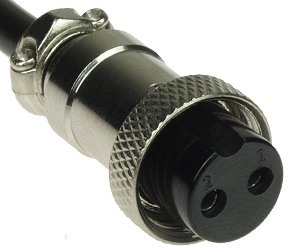 Available with Coaxial plug, RCA plug, XLR plug, House plug, or 3P plug output connector. Sans® brand charger. Battery charger for 36 Volt Li-ion and LiPo batteries. 100-120VAC input power. 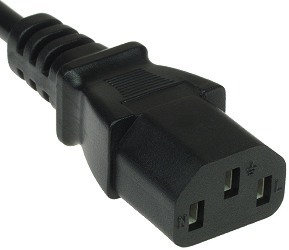 Available with RCA plug, XLR plug, or House plug output connector. Battery charger for 36 Volt Li-ion and LiPo batteries. 100-120VAC input power. 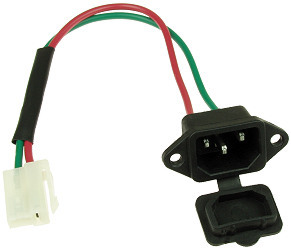 Available with Coaxial plug, RCA plug, XLR plug, or House plug output connector. Battery charger for 36 Volt LiFePO4 batteries. 100-120VAC input power. Available with Coaxial plug, RCA plug, XLR plug, or House plug output connector. Battery charger for 36 Volt LiFePO4 batteries. 100-120VAC input power. Available with Anderson PP45 and House plug output connectors. Battery charger for 48 Volt Li-ion and LiPo batteries. 100-120VAC input power. 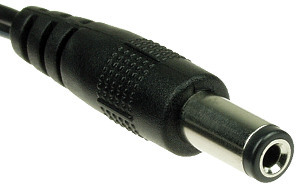 Available with RCA plug, XLR plug, or House plug output connector. 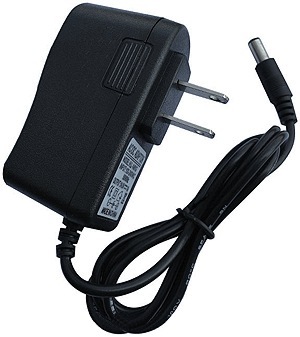 Sans® brand charger. Battery charger for 48 Volt Li-ion and LiPo batteries. 100-120VAC input power. 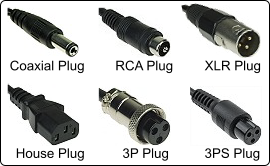 Available with Coaxial plug, RCA plug, XLR plug, or House plug output connector. Battery charger for 48 Volt LiFePO4 batteries. 100-120VAC input power. Available with Coaxial plug, RCA plug, XLR plug, or House plug output connector. Battery charger for 48 Volt LiFePO4 batteries. 100-120VAC input power. Available with Anderson PP45 and House plug output connectors. 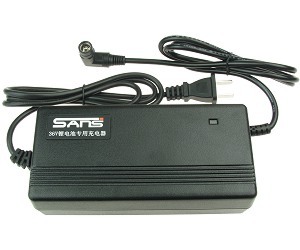 Battery charger for 60 Volt Li-ion and LiPo batteries. 100-120VAC input power. 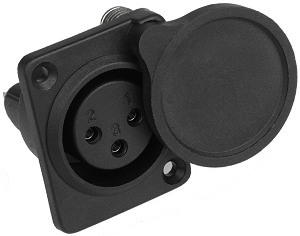 Available with 3P plug, RCA plug, XLR plug, or House plug output connector. These type of scooters are often called a Smart Balance Wheel, Self Balancing Electric Scooter, Self Balancing 2-Wheel Scooter, or Hoverboard. Battery charger for Currie Tech K2 24 Volt 6.4Ah and 9.6Ah LiFePO4 battery packs. 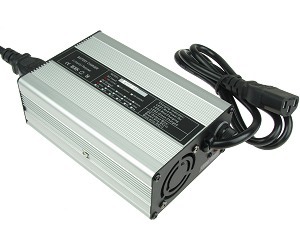 100-120VAC input power. 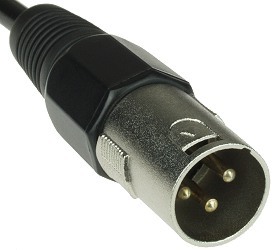 3-pin XLR plug. 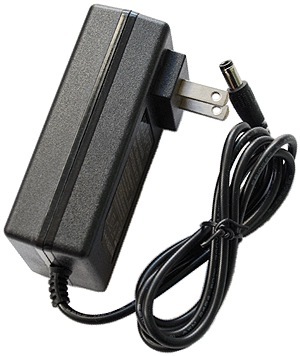 OEM battery charger for the Diamondback Trace electric bicycle. For Lithium battery packs. 48V 2A output. 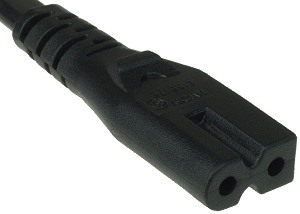 4-pin XLR plug with 3 thick outer pins and one thin center pin. House shaped (pc computer style) electric scooter and bike battery charger port with three pins and built-in rubber dust cover. Three .187" quick connector or solder connection posts on back side of port. House shaped (pc computer style) electric scooter and bike battery charger port with three pins and built-in protective dust cover. Wired with two pin white wiring connector. Matching white wiring connector item # CNX-50. House shaped (pc computer style) electric scooter, moped, and bike battery charger port with three vertical pins and spring-loaded protective dust cover. 10" long wires with two pin white wiring connector. Matching wiring connector set item # CNX-51. 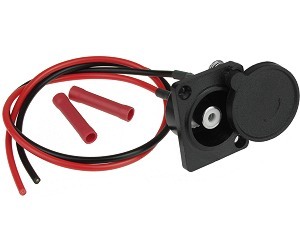 Black nylon 3 pin XLR electric scooter/bike battery charger port with dust cover and 12" of attached wire and two crimp connectors. Cover swings out of the way for charging and covers port when charging is complete. 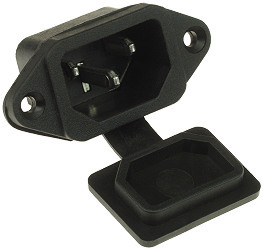 RCA electric scooter/bike battery charger port with dust cover. Commonly used for lithium battery powered electric scooters and bikes. Cover swings out of the way for charging and covers port when charging is complete. Solder connection posts on back side of connector. 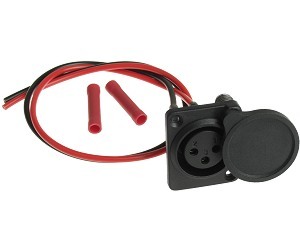 RCA electric scooter/bike battery charger port with dust cover and 12" of attached wire and two crimp connectors. 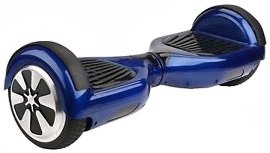 Commonly used for lithium battery powered electric scooters and bikes. Cover swings out of the way for charging and covers port when charging is complete. 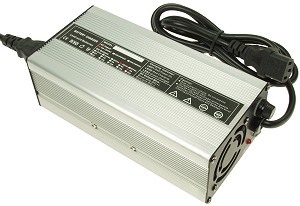 We carry LiFePO4, Li-ion, and LiPo battery chargers for electric scooters, electric bikes, electric go-karts, electric beach carts, electric beach wagons, and all other types of small or light electric vehicle batteries and battery packs.